Allow me to introduce the newest member of the Brown family, Asha! We got her on Friday and we've spent the weekend getting to know each other. She is the sweetest, most adorable puppy. Don't you think? It's the eyes that melt my heart. Those eyes! It's so HARD to say no to those eyes. I first saw Asha when my old co-worker posted a few pictures of her to Instagram - like this one. The cuteness was overwhelming! I didn't realize she needed a home until one photo caption said, "Somebody please adopt this little thing." Of course, I said, "I will, I will!" One criteria for our new home was a place that allowed dogs and ideally had a yard. And we got it! Maybe we hurried into it a bit consider she came to into the family after our second week at our new digs (and not quite all the way unpacked), but I've said it already...how can you say no to those adorable, soul-searching eyes? Asha comes from PAWS, which is a great animal shelter and organization. They were great to work with. In fact, they wanted us to take her last Friday (our first week in the new home), but we felt we weren't quite ready with the house yet. So, they found a place for her to stay an extra week. Then we arranged to meet her to ensure it was a "go," and it was love at first sight! She comes from a shelter down in California, so she's a Seattle transport...just like us! 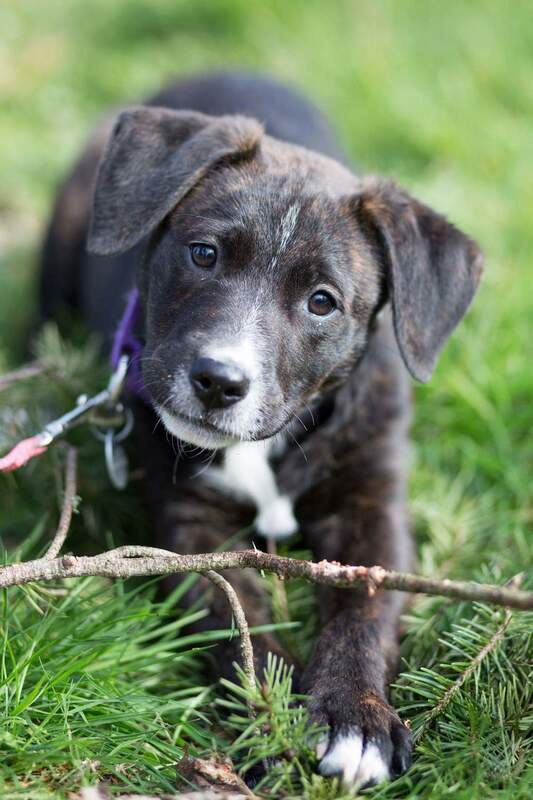 When we first asked her foster mom what breed, she said Asha was a lab mix with maybe some pit. Her PAWS papers said mastiff mix. Then her papers from California indicated mastiff/pit mix. I think she probably has a bit of each! Whatever she is, we love her. Our first, full day with her was Saturday. It was a beautiful, sunny day. We got to spent lots of time playing and walking her. You might be wondering now about her name. We didn't pick it, but we decided to keep it. Asha derived from sanskrit means hope, wish, or desire. I thought it fitting with my first dog named Faith. And then I was really hoping and desiring a doggie FOREVER. Seemed like Asha was meant to be. She was a perfect angel on the ride to her new home. She didn't yelp or bark, but just looked out the window or at us. Our first morning, we took her in the car to a nearby coffee shop. Again, she was just ready for the ride. I have a feeling we'll be taking her around with us...everywhere. We've had some great playtimes out in the backyard. She loves her kong and the tennis ball. She been pretty good on walks, but she definitely got some puppy training ahead of her. Monday was the first workday with her. I decided to work from home to ease her into the new routine we had planned. It turned out, my assistant just slept on the job the whole time. It's hard to find good help these days. We've been trying our best to follow Caesar's best advice for raising the perfect pup. It ain't easy! He makes it sound so simple. We'll be signing up for some training soon. Luckily, her foster moms got her pretty much housebroken and crate trained. We just have to continue the training. And the chewing has been kept to just toys so far (knock on wood). She really is a good puppy. So this is our life for a while - puppy, work, puppy, eat, work, puppy, work on the house, puppy, sleep. But we're loving it!